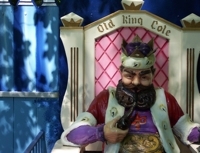 Idlewild is an amusement park about 40 minutes east of Pittsburgh, near the historic town of Ligonier. It's positioned as a "family" amusement park, and definitely caters to kids, particularly younger kids. There are a few thrill rides here, but apart from a small (though worthy) old wooden coaster, you won't find rides here that you wouldn't find at a local fair. The permanent attractions are a bit more interesting. The oddest part of the park, for me, is called "Storybook Forest." Storybook Forest is simply a long, winding path past a number of set-piece sculpted panoramas and the occasional costumed teenager. Each panorama is based on a children's story, fairy tale, or nursery rhyme. Apart from the voices of children and their parents, it's quiet -- the wooded locale helps instill some tranquility -- and fairly meditative. There are some unhappy and depressed looking farm animals in pens scattered throughout to provide additional color. Bo Peep's sheep. The three little pigs. The toddlers we passed were enchanted by it, but much to my surprise some of the older kids ("older" in this context meaning around 8 or 9 years old) seemed to enjoy it as well. I walked past one 8 year old saying to his mother "I thought this would be stupid, but I'm really having fun!" This is the innocence gap; this is the chasm. All through Storybook Forest I'm confronted with the urge to mock, to denigrate, to poke fun at. I can see the scuffed paint and the decrepit shingles, and I can see that Snow White really can't wait for her cigarette break, and I can see that the animals just want to be left alone, and the whole thing just seems sad and depressing to me. But the children love it. They're seeing something I can't see, and I'm seeing something they can't see. The grinning Jack in the Box reminded me of Tillie. In Coney Island, on Surf Avenue, I would ride my bike past the ruins of Steeplechase Park, the place that defined America's very notion of "amusement park." My older relatives would get a faraway look in their eyes when they talked about it. To me, it was like looking at a dinosaur's bones; the parachute jump in particular, skeletal and immense, beckoning from the Verrazano Narrows Bridge, showing me the way to my family and a place to play punchball. 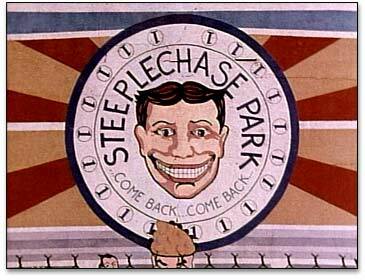 And always the smiling clown, Tillie, shouting "come back...come back..." to the deserted lot he presided over. When I was very young, I thought he was talking to me, making a promise. As I grew, I decided his face was disturbing, and his cry was a threat. Now, with time and distance, I pity poor Tillie, and I figure that he was simply begging someone, anyone, to come back and not leave him alone in his dark empty lot. 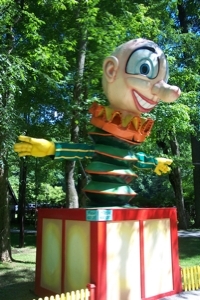 He is the spirit of Coney Island, weeping for the vanished masses. This is, after all, why we hate clowns: they are the makers of broken promises. To grow old is to be battered by the fine print of life, to learn that a promise is only as good as the one making it. In the tattered decadence of the Three Little Bears' house I see every lie told to me as a child. The group of first graders behind me, who haven't yet had to start keeping track of that, see only a good story made real. You can't stop time from moving forward, and you can't stop children from discovering their own truths about the world. But you can treat a child's innocence with respect. And so I present these pictures from Idlewild without the mocking captions I originally wrote for them, without the knowing wink and the wry smile. I've left out the digression about overpriced amusement park food, and the complaints about screaming toddlers and grumpy parents. And if the pictures themselves are framed to mock, or to accentuate the grotesque -- as the Jack in the Box photo above certainly is -- then I apologize, and ask you to look again from another angle, where perhaps a less cynical vision can prevail. Perhaps Tillie's shout of "Come back" is, after all, just an invitation. > This is, after all, why we hate clowns: they are the makers of broken promises. I finally saw "The Fantasticks" for the first time about 8 months ago. I've been at a loss to explain why I thought it was fascinating and my girlfriend hated it. This is a much better explanation than any that I had come up with myself. Still not perfect--maybe you could find a well-reviewed production on the east coast to go see so that you can help me out? I can see that you pride yourself on being a cynic, especially in regards to the childlike innocence of Idlewild Park, where I've worked for almost 7 years. However, I don't think I can read this opinion (I understand it's just that, an opinion) and surf on by. In defense of the park, and especially of Story Book Forest, I think your vision of the area is, in a word, warped. Story Book Forest has been around for almost 50 years (48 this summer), and I think it looks damn good for its age, haha. I understand the point you're making about the way you see the park versus the way the children do, so I won't smother you with a barrage of backlash. Just wanted to let you know I don't agree with your opinion about the park - I don't recall seeing a speck of peeling paint on the houses and sculptures (our artist, Rosemary, is very quick to repair any "decrepit" object), and our calf, Baby, frequently enjoys running and playing with our wonderful, sweethearted farmer Bubba. Maybe I just have the eyes of the children you spoke of because of my connection to the park, but I think Story Book Forest is every bit as enchancting as it used to be when I was a child myself, and we all work hard to keep it that way. I agree with the above. I am the current manager of Storybook Forest and am too in love with the place. I do not appreciate the view that you have of it at all. I could not stand reading this article because you know not what you speak of. So many people have fallen in love with Story Book Forest, I being one of them. I don't like the fact that you have such a horrible opinion of what our forest is like. And for the fact, not ONE of our characters smoke cigarettes. We all work very hard to keep the forest looking nice. I spend about three hours each day picking up garbage and scrubbing down everything in site to keep it looking nice. PLease consider all this before you decide to make fun of us again. I can understand that your vision of Idlewild differs from mine. That makes perfect sense: you grew up with it and experienced it as a child, and I did not. As you somewhat obliquely recognize, that is in large part what my article is about. It's likely that if I took you to Coney Island you wouldn't be as willing to overlook its many drawbacks as I am, precisely because you didn't ever see it through the eyes of a child. I think my description of the park is fair, and if our perspectives differ then perhaps that's simply because we are different people and notice different things. You can call my perspective cynical if you wish, but I'd just describe it as unsentimental. It would be cynical if I dismissed the point of view of the children who adore Idlewild as misguided and stupid, and I do not do that at all. The one inaccuracy in my article I will own up to is saying that you looked like you wanted a cigarette break. Actually, it was another actor (let's just call her "Tinkerbell", who I don't -think- is a character in Storybook Forest, since I don't want to get anyone else in trouble), but "Snow White" served the rhythm of the sentence better, so I took artistic license. I can tell that you couldn't stand reading the article. The way I can tell is that you think that the article is "making fun" of Idlewild, when in fact it is not, from which I deduce that you didn't actually read it. I too am in agreement with Kalie and Snow white. Partly only because I also work there. This is my second year at the park, and although only my second, Storybook forest is a place that everyone comes to love. Everyone who works in Storybook Forest works their hardest to keep the place clean and tidy. We get many comments throughout the day on how nice the place looks and how nice the characters are, and how they can interact very well with every single person walking through the forest. And the only place you may find the paint being worn off of is the bottom of Snow White's apple, due to it being one of the many props the children love, and it being dropped several times a day. The animals in the forest get taken care of very well, and they get their proper meals and exercise. They are one of the many things in the forest that the children love. Obviously you always thought that everything in storybook forest was a big joke, and never looked at the Forest through a child's eyes.. or even with a heart of a child. I know that your article wasn't intended to make fun of Idlewild, but it did offend us, especially us who work in Storybook Forest. I take a LOT of pride in storybook forest, and yet, I do not remember really going there as a child. All I can remember is the castle entrance that used to be there. I've fallen in love with it the past two years, and always will love storybook forest. "I'm confronted with the urge to mock, to denigrate, to poke fun at"...and then you continue to show us things that you decided to make fun of...not to mention that you made captions for the pictures that I would rather not ever know. So don't tell me you weren't making fun of us please. And in closing I must admit, that I too find the jack in the box slightly frightening, but aren't all of them? "I've left out the digression about overpriced amusement park food, and the complaints about screaming toddlers and grumpy parents." 1. Idlewild's food actually isn't that badly priced. It would cost the same at any restaurant. I think that what the stalwart defenders of this amusement park (one I've never been to, but as a child in another state I went to a similar place that probably looks nothing like what I remember) are failing to grasp is that this article isn't really ABOUT you. It isn't about your park. It isn't even about farm animals or paint. It's about how perspectives change when a child becomes an adult. It's more than just getting taller. I, personally, am not going to make any sweeping and nostalgic claims that children have an innocent viewpoint untarnished by broken promises, nor that adults have the sole claim to cynicism. However, mostly children are not ashamed to enjoy things that adults in the same situation are compelled to mock, make excuses for doing, or just plain avoid unless they want to be marked as a weirdo. These things include: stomping in mud puddles.. farting.. reading juvenile books.. make-believe.. and, apparently, going to storybook parks. This guy went to your park for whatever reason. He saw how much the children love it (our culture allows them to, since they're children). It's clear that the people who work there love it too (they're allowed to, in a different way, since it's their job). His respect for the ability to love a storybook park and to see the ideal reality (of imaginary things and storybook characters) behind the imperfect facade (of concrete things like well-maintained paint and carefully-designed costumes and friendly non-smoking actors), an ability which he no longer possesses and can only mourn, is profound enough to overcome the geas requiring cynical card-carrying adults to mock childish pursuits. Stop defending your facade for a moment and try to feel his pain... the pain of a typical adult who looks around and sees, not an ideal fantasy of the imagination, but every broken promise and every lie told to them as a child. Why, yes, Virginia. Of course there is a Santa Claus. I remember storybook forest from when I was a child in the early 70's. And this place is among a long list of fun, loving, fantastic family memories that I will never forget. I am so pleased to see that storybook forest is still around. I can't wait to bring my little nephew to see the park, and hope he loves it as much as i did. These are the kind of memories I have from my childhood and I want to share the same memories with the little ones in my life. My parents did an awesome job making our growing up years enjoyable and fun, and through of all the places we've been and all the things we have seen, storybook forest ranks right up there on top with the best of them. My father recently passed away and it's beautiful memories like these that helps get me through, and it's places like these that some of the best memories come from. And I want our children to be able to grow up knowing that some of the more simple and sweet things in life are the ones we cherish the most. Thank you so much for keeping stroybook forest alive! 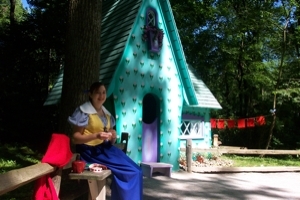 I recently visited Storybook Forest with my eight year old daughter and my husband. Although it was my first visit, my husband visited it many times as a child. He has a personal connection to the characters - his grandfather designed and painted most of them. In fact, my husband was the model for the little boy in the schoolhouse. We are grateful that storybook forest has continued and that my daughter has been able to experience this unique connection to her great-grandfather. Thank you to the people who maintain the park have kept it alive all these years.